Inspire chic finesse in your casual line-up with this shift dress from Libas. 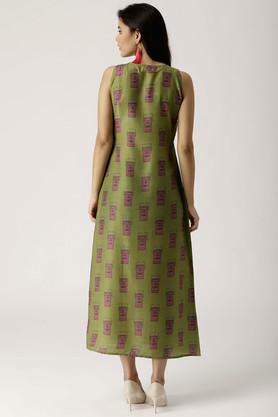 It comes with a printed pattern that makes it look stylish, while the key hole neck provides a perfect fit. This sleeveless dress will ensure a relaxed feel and it is skin friendly. Above all, the use of a polyester fabric promises to keep you at ease. Add an extra dose of style with this shift dress. Style this dress with a pair of wedges for a classy modish look.